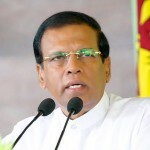 President Maithripala Sirisena continued to follow the footsteps of his predecessor, Mahinda Rajapaksa, issuing a warning to the Joint Opposition Parliamentarians declaring that he will reveal all their ‘secrets’ if they went ahead and created a new party. Addressing an event held in Matara on Friday to commemorate the first anniversary of the UNP-SLFP Government, Sirisena said that some people are dreaming of forming a new government. “I am telling them, if they even try to form a new party, I will reveal all their secrets and create a situation where they will have nowhere but to roam only on the streets,” Sirisena declared. He also said that no one can topple this government and it will continue for the full five year term. 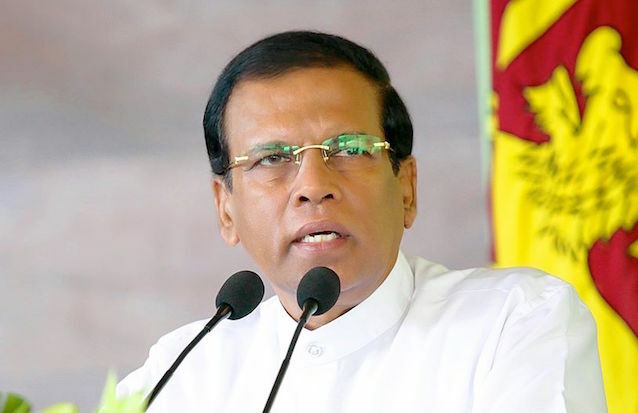 Sirisena said that the people who destroyed the country, who introduced the white van culture, and robbed the country, will never be allowed to return to form a new government. He also said that his government will never be influenced by any foreign power and both Prime Minister Ranil Wickremesinghe and he will save the country from the present economic crisis. In the run up to the Presidential Election in November 2014, Rajapaksa who was President at that time said that he had ‘files’ on all those who broke allegiance with him to support Sirisena who was the Presidential Candidate. “I have details about them all and also ‘files’ containing certain information about them. But I will not use them because I am not that type of a person – I do not seek revenge,” Rajapaksa said then. He has failed miserably in his civic duty as president. Now Rajitha Senarathne will have to get his Doctors ready. This Sira’s blood pressure as risen and piles are getting aggravated. Sirisena looking for a way enter Mount Elizabeth Hospital in Singapore. It appears in future, an ambulance will have to accompany his motorcade. I wonder whether the “Kumari File” has been given to MY3 in case Hakeem has plans to somersault. Just curious ! There is another story to say that there is an invisible hand that is preventing the president from taking action against the Ex-Royal Family. This invisible hand is shielding these criminals from being prosecuted. When we thought that a president of a country can’t go any lower, MS has done it again. How low can politics get in Sri Lanka. If there is evidence of wrong doing the errant politicians must be prosecuted. If Sririsena is hiding evidence he should be charged for withholding evidence, or complicity in crime. What else he can share to the nation at this crtical jucture of lanken politics. He thought the abusive bunch would turn to sense it. But now with 18 months gone, only pulling the leg has been what he faces day by day. WHERE ON THE EARTH a deafeated president made this much of efforts to come back to his kind of highly abusive politics ? There are also masses that rally round to him and support him further… that proves the real nature of srilanken folks. The good news is there is always time to correct mistakes and get back on course.